Imagine this. You have a 26 year old daughter. She meets *the* guy and after a period of dating he pops the question and you’re on the track to launch your daughter into the world. There’s an engagement party. Friends and family gather to express their excitement and joy. A handsome collection of towels, platters and salad bowls are given to the happy couple and stored away while preparations for the BIG day roll on. The house is bought or a rental property secured and furniture is purchased or gathered from friends and family looking for a charitable reason to upgrade their own. The bride is treated to a Shower or Kitchen Tea – where the women in her world huddle to exchange recipes and tips, play random games with pegs, stock her pantry and laundry closet with hundreds of dollars worth of consumables and thirty tea towels and, more importantly, let her know that there are women in her world cheering for her and supporting her in this next stage of her life. Then comes the wedding day. People come from interstate and even overseas. They file into the church in their finery – the married ones reminiscing about their own special day and everyone feeling the privilege of sharing in such a sacred and momentous occasion. Then they eat and dance and raise their glasses as parents and best friends speak blessing and hope on behalf of everyone. The wedding gift registry has been bought out; providing tableware, appliances, linen and decorative items to ensure the couple are well established as they create their first home. And the questions commence about when you might be expecting the arrival of your first grandchild. Your daughter is 26 years old. And she moves out of home. Perhaps she has a housewarming. Maybe she receives a couple of cards and a few candles or table runners. Exchange your daughter for a son and though there’d be some differences in the narrative the end result is similar. A well celebrated, highly affirmed, and practically supported launch into the world. The contrast ought to raise a few questions for us. Who knows if there is marriage in their future or not. Maybe there are still the engagement, showers and wedding to look forward to. But maybe not. What do you think? How do we launch adults with any sense of ceremony and passage without the engagement and wedding process? What is missed for those exiting home and establishing themselves independently without these experiences? What mechanisms might there be to facilitate intergenerational connection or verbalised support? Some people may not want any sense of ceremony and passage when they move out. And I suppose that goes for marriage as well – some people might not want all those around to make a big deal of them at the time. I’m 27, single, and moved out of home when I was 24. I’ve never noticed or felt this as being an issue, and I’m still not convinced it’s an issue. Sure, by the time a bride gets married she has her new house pretty much set up for her and saves a lot of money in the process, but I think that almost ruins the fun of moving out! I’ve set up a house and an apartment and have immense pride and satisfaction that I worked hard and saved up money so I could swipe my debit card at Ikea, domayne etc and buy the furniture, manchester, microwave, tv, washing machine etc that I wanted, and ended up with a house and apartment which reflected me and felt like home. I’ve also felt supported and celebrated both times I moved, thanks to a steady stream of friends and family came to visit me for weekends and school holidays. In short, I don’t feel like I’ve missed out in any way by having to set up my own house/apartment with my own money, or that I feel uncelebrated because I’m not married. In fact I feel very happy and proud that I set up a house and an apartment on my own. 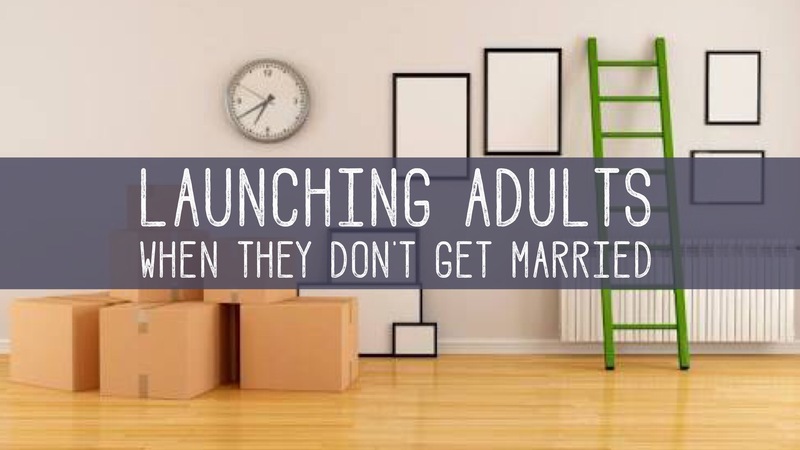 If people feel inclined to ‘launch’ young singles people, then one way they could do this is to just ask the single person if they would like, or need, any assistance in an aspect of moving out or setting up their new place. Whether it be a hand in paying for something eg a fridge or washing machine or the moving truck etc, or someone on call to kill the huntsman spiders. The bigger issue is that the church needs to stop seeing single 26yr old women as desperate Bridget Joneses, and instead see them as God does – as valuable, loved, successful, courageous people made in his image. I appreciate your response Amy. I’m glad you have felt well celebrated and enjoyed setting up your own home. I’ve attended several wedding related events lately where I’ve been invited to write prayers, give recipes and household tips, and encourage the new couple in all sorts of ways (not just through gifts) and I sense this kind of ceremony and intentional handing on of blessing, wisdom and encouragement is not often experienced by those who leave home and move into adulthood without those events. That’s the conversation I’m wanting to spark here – not so much about finances but as I suggest in my closing thoughts some questions over intergenerational “passing on” and connection. Yes, so true!! I’m single and in my 30s, and moved out of home in my late 20s…it seems that everyone is still waiting (and pleading?! lol) for me to go through the ceremonies you mention above, all the while thinking my singleness is something they need to fix. The process of buying a house and moving out for me seemed to just go under the radar…not as exciting when it’s not teamed with marriage I guess! Having said that though… moving out of home was a huge adjustment for me, so looking back, not sure I could’ve done that as well as gotten married and dealt with all life changes that come along with both. Great post, thank you!